We are renovating an old Japanese style house in Iga city with DIY （By the way, Iga is a famous ninja city）. 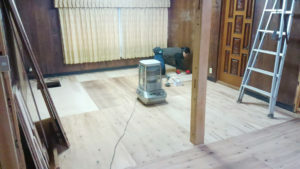 I wrote in the last this blog that we removed the deteriorated floor and finished building a new board . Today we plan to increase the strength of the floor by putting another board on top of this. At the same time, we are going to start repairing the ceiling which was damaged due to leaks. We started putting up the second layer boards. 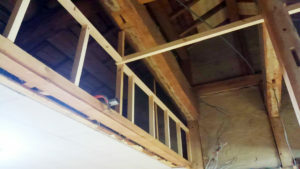 We also began repairing the framework of the ceiling lost by leak. This kind of landscape will continue for a while, but it is surprisingly fun work for us. 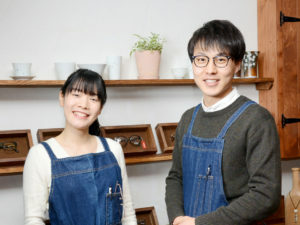 Please look forward to the future.